The European Space Agency (ESA) has awarded Astrium, Europe’s leading space technology company, euro 108 million worth of prime contractor agreements covering the development of the Ariane 6 and Ariane 5 ME launchers. The contracts follow on from the decisions reached at the ESA Ministerial Council meeting in Naples on 20-21 November 2012. Under these contracts, Astrium will launch the initial definition and feasibility studies for the future Ariane 6 European launcher. Expected to run for six months, the study phase aims to identify the concept and architecture for Ariane 6 and will set out the new launcher’s main specifications prior to its industrial development. An outline of Ariane 6′s design has already been established: it will be a modular rocket with a payload capacity of 3 to 6.5 metric tons in geostationary orbit. Dubbed PPH, the launcher’s configuration comprises two lower stages in which solid propellant is used and a cryogenic upper stage powered by a Vinci restartable engine, developed by Snecma (Safran Group). 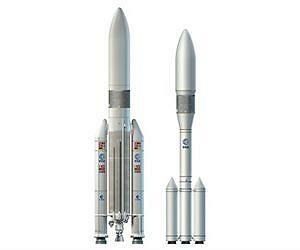 Read more: Astrium wins ESA contracts to design Ariane 6 and continue development of Ariane 5 ME — Space Travel.